Ingredients: MICA, ZINC STEARATE, STARCH OCTENYLSUCCINATE, DIMETHICONE, SILICA, NYLON 12, MAGNESIUM SILICATE, TRIMETHYSILOXYSILICATE, ETHYLENE/ACRYLIC ACID COPOLYMER, PHENOXYETHANOL (AND) ETHYLHEXYGLYCERIN. MAY CONTAIN: IRON OXIDES, BISMUTH OXYCHLORIDE. Ingredients: Mica, Cyclopentasiloxane, Isododecane, Tridecyl Trimellitate, Cycolohexasiloxane, Disteardimonium Hectorite, Hydrogenated Polydecene, Bis Diglyceryl Polyacyladipate-2, Methicone, Titanium Dioxide, Tricaprin, Hydrated Silica, Aluminum Hydroxide, Aluminum Starch, Octenylsuccinate, Talc, Hydrogenated Polybutene, Aroma, Propylene, Carbonate, Phenoxyethanol, Tocopheryl Acetate, Aloe Barbadensis Leaf Extract, Cyclotriloxane, Ethylhexyglycerin. May Contain: CI 77492, CI 77891, CI 77491, CI 17200, CI 15850, CI 77499 CI 45410, CI 77015, CI 75470, CI 42090. 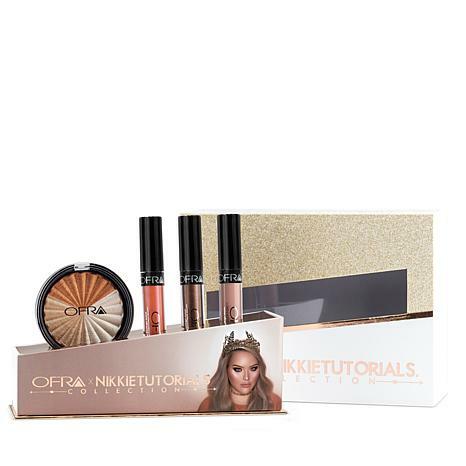 I've always wanted to give the Nikkietutorials set a try so when I saw this I was super excited. Upon receiving it, I have to say it met all my expectations. 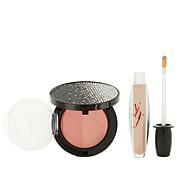 The packaging is gorgeous, the lippies glide on smooth and dry down quickly, leaving a lovely, highly pigmented color. The highlighter is so pretty and bright! I can see what all the fuss is about. I've used it daily since purchasing. I love the lip color spell. It is a bright beautiful orange. It does not make your lips look like a dry prune like other liquid lips do. The highlight is gorgeous. I do not give a care about the cheap packaging because of the bright beautiful glow of the actual highlight. 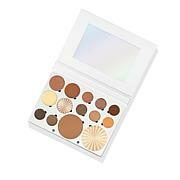 Use the bronze part on eyelid it is great looking. If I want cute packaging with no substance I will buy too faced. This is awesome at $39.00. What I've been missing! The lipsticks are unbelievably soft and so pigmented. The highlighter is out of this world. It can be either popping or subtle you control the level. Really surprised Ofra exceeded my expectations. The highlighters use it everyday.. liquid lipstick not so much, I only use the lightest color.. the other two I gave away to a friend.. didn't like the orange pink color or the copper color.. I didn't like it with my skin tone, made me look older But looks beautiful on my friend who has darker skin tone..